An account of the extraordinary accident which happened to a Yorkshire farmer while shepherding in the lonely recesses of Shunner Fell, Swaledale. James Iveson’s predicament is probably unique in the annals of the fells. Occupying but a few brief lines in the daily Press at the time when it occurred, the story of James Iveson’s strange adventure sixteen years ago has never been fully told, and I determined to get it from his own lips for the benefit of the readers of THE WIDE WORLD MAGAZINE, if only to show that as strange things happen occasionally in this prosaic old country as in the wilder parts of the earth. 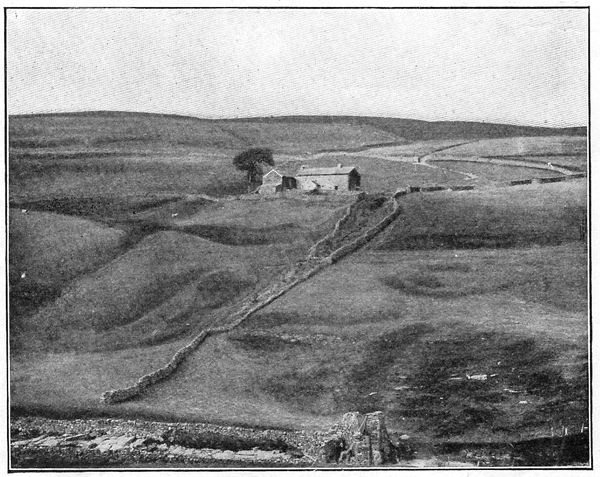 Iveson’s home at Angram is nine miles from the nearest railway station – Hawes; and to reach it one has to cross a mountain two thousand feet high. I managed to catch Iveson at Muker Agricultural Show the other day, and, seated on the “stang” of an empty cart, jotted down from his own lips his story. 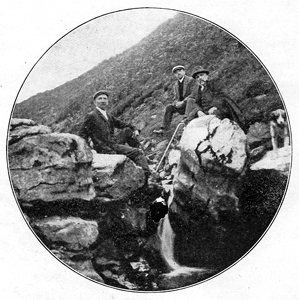 But the narrative would have been incomplete without a photograph of the scene of his adventure, and I therefore arranged to meet him later at Shunner Fell. Behold us, then, tramping from Birkdale, the nearest farmhouse, up the Sleddle Valley, past Bleaberry Beck, and up Wavery Ghyll, whence a good stream of water gathers from the slopes of Shunner Fell and swells the volume of the River Swale below. 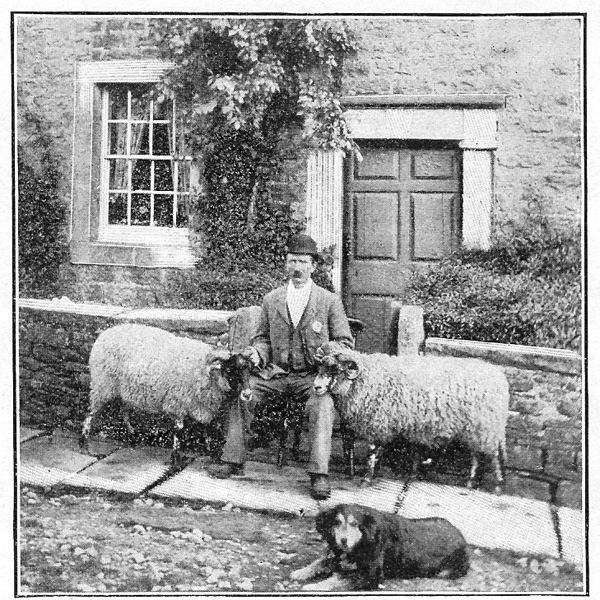 It was on Sunday, September 2nd, 1894, that I started out from my home at Angram, Swaledale, to do a day’s shepherding among my sheep. It was at the height of the grouse-shooting season, and I had been busy driving and beating for the Keld Green shooting party all the previous week, and was anxious to see how my sheep were getting along on the fell. Moreover, the members of the shooting party wanted two fat sheep, and these I intended to bring home with me after seeing to the rest of the flock. Starting at eight o’clock on the Sunday morning, with a bit of bread and cheese in my pocket, I walked the ranges of fells west and north-west of my home, pursuing my way leisurely up one ghyll and down another, taking it easy, as I had had a hard week beating the fells with the sportsmen. About three in the afternoon I got to Wavery Ghyll, on Shunner Fell, and as I was crossing the beck I sat down to rest on a huge boulder which lies in the middle of the beck, hanging my right leg over the edge of the rock. A few inches in front of me was another big rock, stuck up on end, and between these two rocks the stream filtered downwards in a pretty little waterfall. As I sat I reached out and laid my hand on the boulder in front of me. Suddenly, without the slightest warning, it spun round, though it must have been some forty tons in weight, and crashed up against the rock on which I was sitting. As it moved it caught my leg below the knee, cutting the muscles, smashed my strong boot to pieces, and tore the leather legging. But for the fortunate circumstance that there was a slight depression in the rock on which I was seated, at the very place where my leg hung, the bone would undoubtedly have been smashed to smithereens. "My leg was firmly gripped between the two boulders as though in a vice." For a few moments, what with the excruciating pain and shock, I could hardly realize what had happened; it seemed incredible that this great rock should have moved. Then, as my brain grew clearer, I realized that the boulder must have been so delicately poised upon its base that the light touch of my hand was enough to dislodge it, and its own crushing weight did the rest. Instinctively I tried to withdraw my leg – now rapidly becoming numb – but it was as firmly gripped between the two boulders as though in a vice, and the effort only brought fresh agonies of pain. Ceasing my struggles, I sat back and tried to consider calmly what to do. Here I was, a helpless prisoner, seven miles from my own home, in the very loneliest part of the fells, where I might remain in this rocky trap for days, and gradually bleed and starve to death. I had my sheepdog Bess with me, and as I looked at the faithful creature – obviously much puzzled at her master’s strange plight – I had an idea. I thought that if I could write a message, tie it round her neck, and send her home, she might fetch help. Eagerly I searched my pockets, only to find, however, that I had no pencil! Once again, with a sinking heart, I went through my belongings, and finally alighted upon an envelope addressed to myself. This, I thought, was better than nothing; anyone discovering it would surely put two and two together and come to the conclusion that I was in trouble somewhere. Accordingly I tied the envelope round the dog’s neck, and then told her to “git away hyam” (home). The faithful animal was very reluctant to leave me, and I finally had to stone her away with such small pebbles as I could reach in my imprisoned position. At last, to my infinite relief, I saw her disappear over the shoulder of the hill in the direction of home, though she gave me many a backward glance. There was nothing to be done now but to hope that she would find her way home and bring help. After that I spent several hours in fearful agony of mind and body. I shouted, I cried – with the pain and mental strain – and I prayed, but the time dragged slowly on until night set in, and it became pitch-dark, and still there was no sign of help coming. I found out afterwards that my cries had been heard at five p.m. by a man who was walking down to the chapel at Keld, but he imagined that I was calling the dog. Another person also heard me, but thought that I was at my ordinary work and directing the dog. It was seven o’clock at night, I discovered subsequently – four hours after the accident had occurred – before the dog reached my home at Angram. The envelope tied around its neck told its own story of something wrong, and quickly a search party of fifteen started out, the members going in various directions in the endeavour to find me. Ten of them, after searching for hours, gave up the quest and returned home, it being too dark to see anything. In the meantime, as the hours went by, I was getting very much exhausted with shock, loss of blood, want of food, and cold, for it was a very frosty night. About ten o’clock I heard some grouse come flying up the ghyll – a sure sign that they had been disturbed lower down. I felt certain that someone was at hand searching for me, and I renewed my cries with all my strength. Still, no one appeared, and was just about to give up in despair when five of the searchers approached Wavery Ghyll, over the Tongue or Addenay Rigg, led by the faithful old Bess. Suddenly, they told me later, she pricked up her ears as if she heard something, and they then felt sure the missing man was not far away. All at once I saw several figures appear on the sky-line on the hill in front of me, and a moment later they came rushing down to me. I found them to be Ralph Peacock of Muker, Simon Fawcett of Angram, James Peacock of Skeugh Head, Jeffrey Fawcett of Angram, and John Iveson of Angram, my nephew. It did not take my rescuers long to find out that they would want hammers, chisels, and wedges if I was to be liberated, and several of them hastened off to Birkdale, three miles away, where they obtained the tools. Accompanied by Robert Thornborrow, the occupier of the farm, they started back, reaching my lonely open-air prison about midnight. 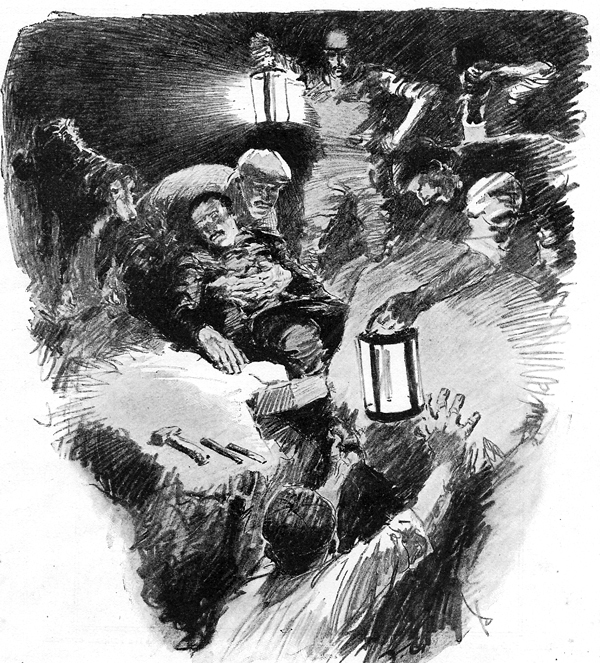 Here, after three hours’ hard work – surely as strange a job of midnight hewing as was ever tackled – sufficient stone was chiselled off around the limb to admit of its being drawn out, and I found myself a free man again, after twelve hours of torture. "Sufficient stone was chiselled off round the limb to admit of its being drawn out." They half carried me up the bank, to where a sledge was waiting, and thus bore me over the rough mountain-side to Stonehouse – where I had some food – and then on till we reached the road at Hoggarts. The rest of the journey I made in a trap. I was put to bed and lay there for some time, but after getting up I went on crutches for thirteen weeks, and then for a long time on two sticks. I am now as well and strong as ever, but the toes of my foot are crumpled owing to the injury to the muscles of the leg, and I walk slightly lame. The dog seen in the picture of my residence is not Bess. She, faithful creature, has gone to her last rest, but I shall always feel grateful for the fidelity and sagacity which undoubtedly saved my life and rescued me from as strange a mishap as ever befell a shepherd on the fells. 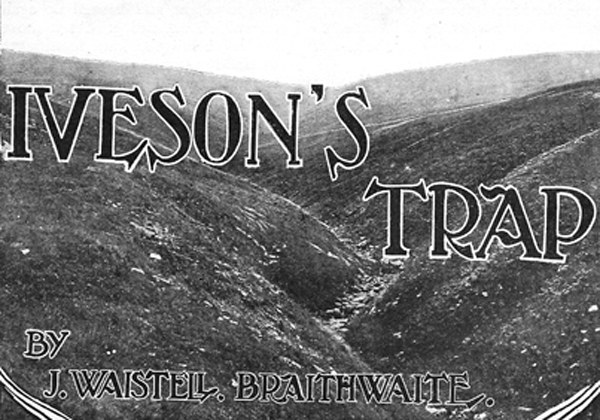 The place where the accident occurred is now called “Iveson’s Trap” by the shepherds of Upper Swaledale. Iveson sitting on the rock which held him prisoner in exactly the same position as when the accident occured. The last photograph reproduced shows Iveson seated on the rock in exactly the same position he occupied when the accident occurred. 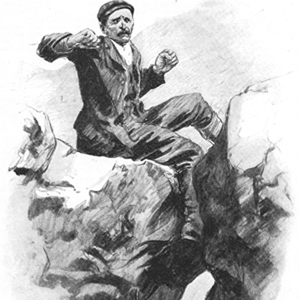 It will be observed that the boulder which imprisoned him is now about eighteen inches from the stone on which he sat, but this is explained by the fact that the great flood or cloud-burst of July 12th, 1899, washed huge boulders down this ravine and partially shifted the position of the rock.